Hello! For some time, I pondered about changing my domain to one that was more unique. If you’re not aware, I used to have ‘The Sapphire’ for my domain and all my social media sites. But it always bothered me that I didn’t choose a very original name. That’s when Misty Prose was born. I came up with this name after “Misty Rose“, a pale, pastel pink color. But if I used that same name I would basically be stealing an already established name, so I decided to give the name a little twist. Prose, as you all know, refers to all natural flow of speech, and I feel it quite represents a big portion of my passions – writing, literature, and language. 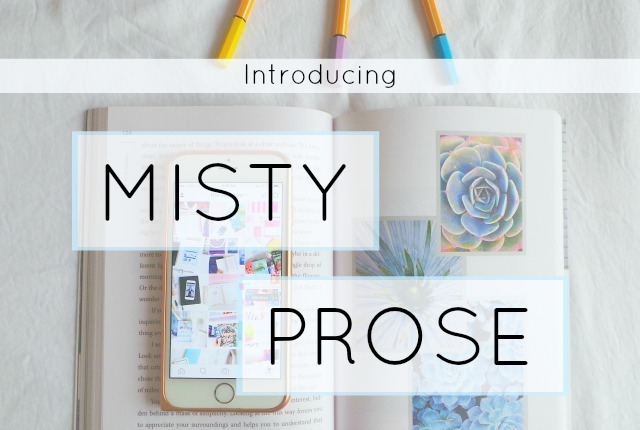 Fortunately, I was able to change all my social media names to “mistyprose”, except for my email (mistyprosee@gmail.com) and my Instagram account (@misty.prose), *sigh*. The last reason – possibly the most important one – I changed my domain was because I felt I needed to re-brand myself. I initially created The Sapphire with a mindset, and I tried to involve myself among a certain community. But gradually, I realized that I… didn’t really fit in the popular communities. Maybe it’s because I’m still discovering what I represent, or maybe I just haven’t found my niche yet. The point is – along with creating Misty Prose, I hope to start blogging, among other things, without the identity that I had classified myself into before.